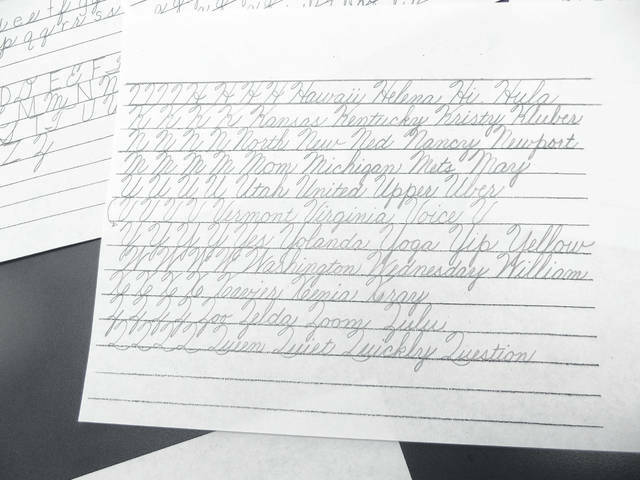 This is a sample of the cursive writing lessons Sarah Eichenauer will be using in her upcoming classes. 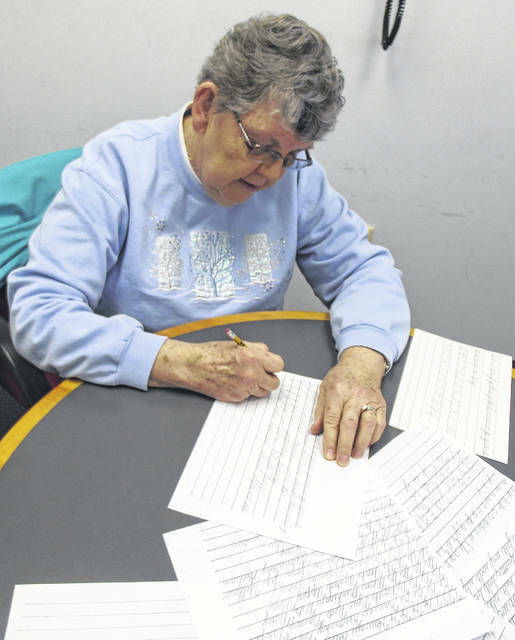 Retired teacher Sarah Eichenauer practices her cursive handwriting. She will be holding classes to teach people how to write in cursive handwriting. SIDNEY — Retired teacher Sarah Eichenauer, of Sidney, is ready to teach a “secret language.” She’ll be holding classes to teach adults and youth how to write cursive. The desire to teach the class came from two directions for Eichenauer. She has grandchildren who can’t write in cursive and she and a few members of her church — First United Methodist Church — were pen pals for children who attend a church camp each summer. Some of the letters were written in cursive and the children would have to find an adult to read the letter to them. “They can’t read my (cursive) handwriting,” Eichenauer said. “How are they supposed to write their names on checks or signing something in a doctor’s office. “I feel there’s a need for this,” she said. Susie Valentine, said Eichenauer, asked them to write the letters to the youth attending camp. Some of the them, she said, wouldn’t get any mail during camp and Valentine wanted to ensure everyone got at least one letter during the Tar Hollow Southern Ohio Christian group camp. So Eichenauer put on her thinking cap and came up with the idea of teaching a cursive handwriting class. The first class will be held April 17 at 6 p.m. at Amos Memorial Library. Class size is limited to 12 students. A total of six classes will be held. Eichenauer said she talked to her husband, DeWane about teaching the class before she had the plans finalized for the classes. And thinking of her response, Eichenauer decided she had time to teach this important subject to those willing to learn. “Now, he thinks it’s a great idea,” said Eichenauer. Eichenauer had several things to decide before announcing she was teaching the class. Where should the classes be held? How long and how classes should she include in the program:? How many students should be in the classes? With an OK from the library to host the class there, Eichenauer began the process of looking for students. She has placed flyers around Sidney informing the public about the classes. The first class, she said, will deal with the letters i, t, u, w.
Eichenauer, who has taught first through fourth grades in Fairlawn and Sidney school districts, cursive handwriting was first introduced to students after Christmas in second grade. Eichenauer said the students in the classes will be taught both lower and upper case cursive. They’ll also be able to look at the printed alphabet and see how the cursive letter is different. To sign up for the class, email Eichenauer at writeupon@gmail.com.